Vincent likely travelled to Harrisburg to attend a convention for the Equal Rights League of Pennsylvania, held on Wednesday, February 8th, beginning at 10 o’clock. A notice published in The Christian Recorder on December 17, 1864 implored readers to “Come from your mountain homes—come from your valleys, and organized for united action. The franchise, the interest of the colored soldier, the means and manner of education in our State, demand our earnest and undivided attention.” The article named as organizers of the convention Jonathan Gibbs, Emilie’s pastor, Jacob C. White, Jr., the director of her church’s Sabbath school, and Alvin Green, mentioned by Emilie on September 24, 1864. “Call,” The Christian Recorder, December 17, 1864. 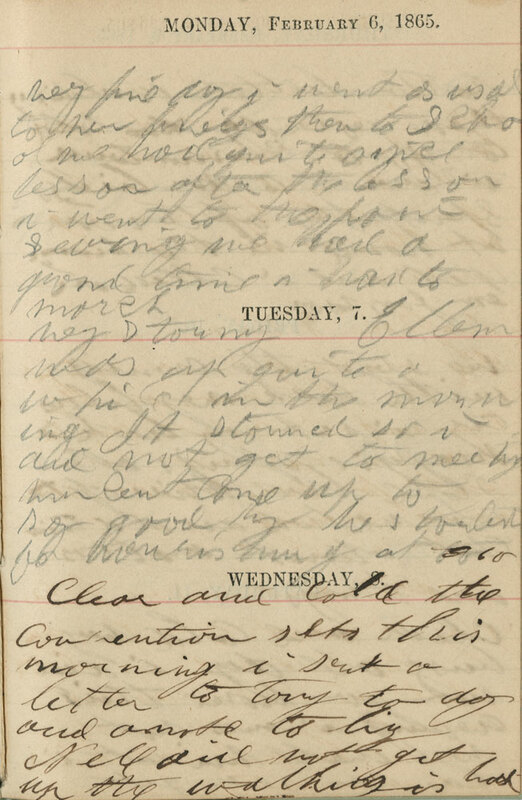 Emilie elaborates on these events in the miscellaneous section of her diary, to view this entry click here.